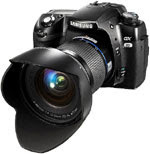 The GX-20 improves on many of the advanced qualities of its sibling dSLR, the 10.2 mega-pixel GX-10; however a host of new features and firsts truly set this camera apart from any other GX-Series model previously introduced by Samsung. The GX-20 is highlighted by its proprietary, high-performance CMOS sensor. The Samsung CMOS sensor is equipped with 14 mega-pixel resolution, can capture 14-bit Raw images and maintains outstanding noise performance, even at a high ISO setting of 6400. The GX-20 also incorporates improved sensor-based shake-reduction as well as a double dust-removal system, which is designed to prevent miniscule specs of dust from ruining a perfect image. Designed for the advanced amateur and professional photographer, the GX-20 is the fourth model in Samsung's rapidly growing dSLR range. The premier model of the GX family, Samsung's new GX-20 takes performance to a whole new level with an array of new and improved features, all which will allow users to capture images of uncompromising quality in any environment or setting. Photographers of all skill levels will appreciate the GX-20's large 2.7 inch Live View LCD screen, which allows users to check composition and focus directly on the LCD in real time.